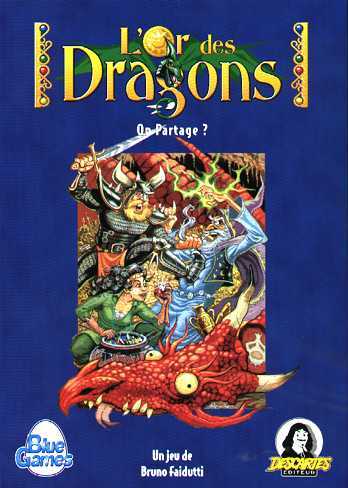 Enter the dragon's lair, where fame and fortune await you and your team of brave dragon slayers! A few magic weapons, some bravery and a bit of luck is all you need to slay the dragons and take your treasure home... Or is it? Killing a dragon is the easy part. Now you have to divide the loot! Will your "friends" give you your fair share (or maybe a bit extra)? You have only 60 seconds to find out! Dragon's Gold - Sometimes, your toughest adversaries aren't the dragons! Each player controls a team of dragon slayers (two knights, a thief, and a wizard). Like all dragon slayers, they have only one goal: Cool magic items and lots of treasure! Actually killing a dragon is a piece of cake. The most difficult task comes after the smoke clears and the dragon is dead: Agreeing how to divide the loot! Once a dragon is killed the players that killed it have 1 minute to agree on how to divide up the treasure! If they can't decide, none of them get any! To make it more difficult, the treasures all have different values. Dragon's gold is a game of frantic negotiation and compromise. The whole of whether or not you should get this game comes down to one issue: Does your group like negotiations?